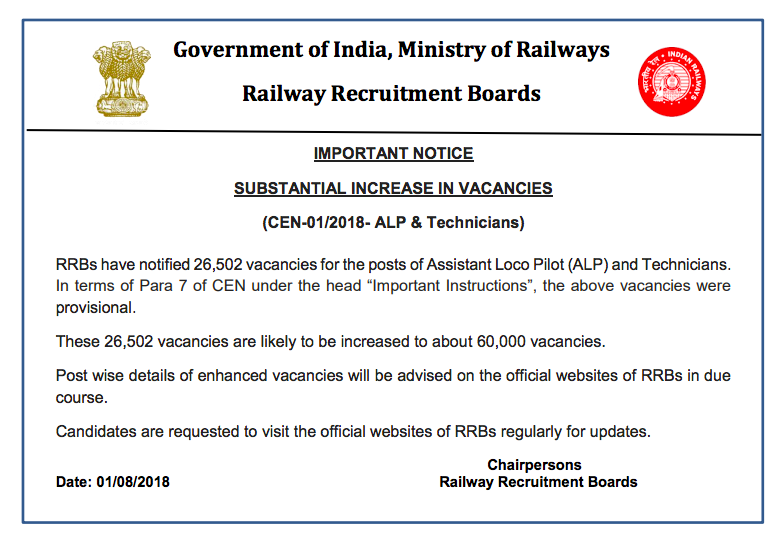 RRBs have notified 26,502 vacancies for the posts of Assistant Loco Pilot (ALP) and Technicians. In terms of Para 7 of CEN under the head “Important Instructions”, the above vacancies were provisional. These 26,502 vacancies are likely to be increased to about 60,000 vacancies. Post wise details of enhanced vacancies will be advised on the official websites of RRBs in due course. Candidates are requested to visit the official websites of RRBs regularly for updates. Click Here to get the Best online Mocks for RRB ALP Technician Exam 2018.